You can absolutely feel the sadness and apprehension of the young daughter as the family packs their car and trailer with all of their belongings before setting our on a move to another community. The pregnant mother waves a fond goodbye as the dad and a neighbor add the final furnishings to the car's roof. The sun is rising. After a quiet look at her empty bedroom, she carries a box packed with personal treasures out to the car. They wave goodbye to neighbors and friends. Bravery comes in many forms; this little girl would rather not be moving. Poring over a photo album, while sitting in the back seat surrounded by her favorite stuffed animals, reminds her that there have been other times when she needed to be brave. Looking out the car's window reminds her that there are scary things out there. Can she find the strength she this time? "On those days, look deep inside to find the courage you need. shining its light in the dark. spark - but you can turn it into a flame." What a lovely affirmation for all the emotions the young girl is experiencing on this trip to a new home, a new life, a new reality! Eliza Wheeler uses India ink, watercolors, colored pastel crayons, and acrylic paint to build gorgeous panoramas that reflect every mile of the journey made. Her color palette changes with the little girl's concerns, and guarantees that a young audience will be captivated by the images. Lovely! 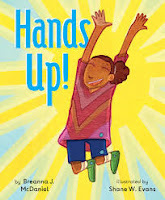 In her debut picture book, Breanna McDaniel looks at the many ways children raise their hands for very specific purpose. The sun rises as do the hands of a little girl, joyous as another day begins. Turn the page and the parents take a quick 'peek' at her, helping her get dressed when she puts her hands up again. High hands are needed to reach for a glass of morning milk. OOPS! Now, hands reach up for a damp cloth to clean the spill. As the day passes, each ensuing scene portrays another way that 'hands up' make life better. In class, stretching for a library book, practicing dance, riding her bike, even being helped up after that bike crashes. Then, there's music, a basketball win, and helping out. It doesn't end there either - I will leave you to discover the collaborative final scene on your own. Shane Evans' mixed-media images shine with bold color, lively expression, and gorgeous textures. Brimming with charm and a positive outlook no matter the day's highs and lows, children will see themselves in many of the familiar scenes. Love and resilience is at its heart, and readers will come away from the story with a sense of the strength felt in community. Seal is looking to make new friends after her recent arrival from a French zoo. No word of welcome from any of the zoo's denizens is perplexing and disappointing. Then, a sparrow's quick peck is all she needs to give her freedom to make the first overture. "Snow Leopard didn't groan or grumble. He didn't gag. Instead, he growled. It is immediately evident that Seal has no idea. Her sad countenance and deflated spirit lead her right back to the water that is her home. Sparrow is not pleased, and reminds the others about being new and alone. It turns the page for the group. 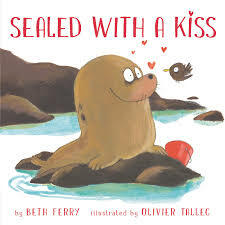 Their heartfelt gift of poetry is just the incentive Seal needs to realize that a dietary switch from sardine to shrimp might be just the ticket. Soon, she is feeling the warmth of many new friendships. Olivier Tallec creates appeal with his expressive, dramatic animals ... an appeal that is sure to delight young listeners. He cleverly matches the fun found in the humorous text. It's a great way to get kids talking about differences, friendship, and finding a fit within a new group. as a pulse of air. always showed up for the birds and taught us all to do the same. This book is for you." They are a family of birders; their love emanates from every page. The endpapers begin our journey. Familiar sayings about birds find pride of place, soaring above a flock of blue silhouetted birds in flight. The table of contents provides all readers need to know to lead to what piques interest and inspires fascination. There is a brief introduction, followed by 12 sections: sections that describe birds themselves, an ancient history of birds and birds in history, state birds, listening to and looking at birds, how birds move and what we can do to save them ... the list goes on. It is a gorgeous book. You will find yourself returning to it often to read just one more entry. You might be interested to know the records that specific birds hold: largest, smallest, fastest wingbeat, slowest flying, smallest nest or largest one. Or you might be surprised to know how birds have found a place in the arts: print, music, ballet, poetry, even movies! A birdathon is suggested, and ways for readers to become citizen scientists ... a lasting consequence for all they have learned while sharing it. Back matter is plentiful. An author's note from each contributor is followed by acknowledgements, websites, online sites for joining others in a bid to protect and save the world's birds, a selected bibliography, a list of credits, the scientific name for each bird in the order of presentation, an index, and an extensive list of photo credits. 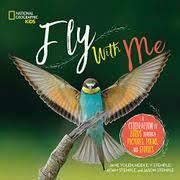 Have you got a bird-loving friend, are you looking for a gift for your child's classroom, or just interested in knowing more about birds yourself? This is a wonderful purchase. Evident is the love, and the talent of this birding family! 'termitariums', are used ... "
I really like this series of books. I earlier posted Amazing Animal Journeys, and look forward to telling you all about Amazing Animal Babies soon. Chris Packham has great credentials for penning these informative and accessible books for young readers. He was the presenter for a BBC series called The Really Wild Show before striking out on his own to make shows for the BBC, National Geographic, Animal Planet, and ITV. He has also presented two shows for the BBC called Springwatch and Autumnwatch. Not surprising that his love for the natural world has led to terrific books for a young audience. There is great variety in the homes that sustain and protect animals; they need a place to stay, just as we do. A four page introduction provides a look at those various places and why they are perfect for the animals who choose to live there. Following that, each double page spread focuses on one particular creature and the home it creates. for snakes, birds of prey and even domestic cats. dome-shaped nests that look like little ovens. chamber lined with soft grass and feathers." Jason Cockcoft adds fascination beyond what the text shares with his warm and wonderful illustrations of children making discoveries in the many settings described. Readers will be intrigued by the clear details and the numerous labels that assure understanding and new learning. 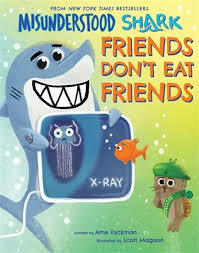 Reading Ame Dyckman's much anticipated sequel to Misunderstood Shark (Orchard, 2018) this morning unleashed many memories and thoughts. I have a dear friend who swears she will never go on a cruise, as she is sure there is a shark out there in the ocean just waiting for her to look over the side of the cruise ship. Nothing can convince her that said shark has not been waiting until that very moment for an 'old lady lunch'. HA! Her daughter-in-law just swam with the sharks last week ... her second time in Hawaii! It is not a story she wants to hear told. 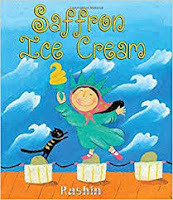 In the summer when my granddaughters were visiting, I read the initial tale numerous times in a day; it was a whole lot of fun, and had us giggling every time. They will be delighted to know that Shark has coughed Bob up and is somehow surprised to see him. Not the most auspicious start to a new episode of Underwater World with Bob. Bob is ticked and he thinks that Shark should understand why. Shark, as he has done before, tries to help Bob understand that he simply misunderstood his intention. He thought he was just giving Bob a tour of a shark's inner structure. Giggle worthy? You bet. Ms. Dyckman has good reason for wanting to share these stories about sharks. "Like a lot of grown-ups, I was afraid of sharks. But a lot of kids think sharks are AWESOME. The more I looked into why, the more I saw sharks really ARE awesome—they just get a bum rap. Not to say sharks WON’T eat when they’re hungry or when they think something smells good, but in almost all interactions with people, sharks really aren’t trying to eat us. Thought it was time to share that." By reading her stories, she hopes that children will not grow up with the same fears she has always felt toward sharks. She tackles the subjects of friendship and anger with amusement and some hilarious back-and-forth between the two, while also injecting factual information about the much maligned ocean dweller. Scott Magoon ups the comedy with his cartoon-like renderings of the ocean and its many creatures, the film staff, and the compulsive action that is taking place every moment. This is terrific fun. I can't wait to share it with kids! Here's some food for thought! "Otto went around to his neighbors and told them the story of the spiny, green ball ... and the little thing that goes "Pio," whose mother absolutely needed to be found. Otto didn't know how to take care of a tiny creature. But no one had seen the green ball, or the mother of the green ball, or anything that looked like the small, furry thing inside the green ball. "Mommy!" cried the creature upon Otto's return." Is this another case of mistaken identity? It isn't often that an odd-looking green ball shows up on your doorstep ... especially if you are a squirrel living in a big, and very old, tree. So, when Otto notices that spiky ball one morning, he ignores it. Off he goes to complete his daily errands. Upon his return, the ball is still there. Otto seems oblivious to its presence. It is only when he hears a noise, checks the branch and sees that the ball is hatching a small, round, furry being that he begins to pay attention. When the creature calls him mommy, he is quick to discount that premise. Wary that the mother might return, Otto goes back inside. Nothing happens. The creature remains long into the evening. Otto is gracious and hospitable, and invites the creature in for the night. "Good night!" said Otto, turning off the light. "Mommy!" replied the little creature from under the warm blanket. "No! I am not your mommy. My name is Otto. "Alright, Pio will do for now." As days pass, and Pio grows more and more immense, their living space becomes very crowded. It is a problem. The events that follow will delight and gain wide approval from young readers. Finally, when Otto is threatened with grave danger, Pio proves his worth as friend and companion. If you follow this blog, you will know that I have great admiration for Marianne Dubuc and her wonderful books. In this quiet story about friendship and kindness, she just makes me love her work even more. Her detailed, carefully colored spreads bring a sense of peace and contentment as children listen to this tale that meanders slowly to a warm, and pleasing conclusion. Humpty Dumpty's sad story ... "
If I had worn glasses from the time I was very young, I may not have wanted them so badly when I was in junior high. But, want them I did, and I never got them! Surprise! Then, when I was about fifty, my eyes started changing and I had a need for progressive lenses, for goodness sake. Mostly I needed them for reading. Since I read all the time, and didn't want to be taking them off and putting them on, my optometrist suggested a slight adjustment for distance. Voila! I could easily read every book I wanted to share with library classes! All that to introduce this imaginative take on getting your child, who hates wearing glasses, to wear them. Ava is having a very tough time in school one day. She tells her teacher that she forgot her glasses at home. Being observant and knowing her young student well, Mrs. Cook decides to use this particular moment to teach a gentle lesson. 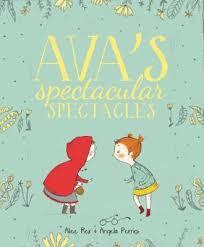 She places a large book in front of Ava and suggests that things might have been different for Little Red Riding Hood. "She would have seen the big teeth and big eyes." Ava looked up. Mrs. Cook turned the pages." What an ingenious way to include some favorite folk tales and nursery rhymes that give Ava pause, and have her consider the real advantage of wearing glasses. She gains confidence as she realizes that some of her favorite characters should, perhaps, have been wearing glasses as well. Donning her glasses is the solution. Now, she can read again. The digitally colored double-page spreads are most enjoyable, and add lively visual storytelling to the text. Original, charming, and fun, this story might be just what a young reader needs to encourage the benefits of wearing those dreaded eyeglasses every day. For older students, what about offering up suggestions for other folk characters who might have benefited from available devices. and I love the view and I ... "
There are times when learning a lesson takes longer than we might think it needs to take. In her first adventure, Wordy Birdy let her talking get her into trouble. Not just any talking ... she talks incessantly! I'm sure you know someone like her. I was going to say a 'little one' just like her, but talkativeness doesn't seem to be confined to children ... at least, not in my world. Talking too much gets many of us into trouble. Wordy's friends are very patient with her, listening as she chatters on and on. She is oblivious to much of what is going on around her, and the feelings of exasperation as the day moves from sunshine to shadow, and sleep beckons. Her friends go to bed. Wordy does not. She needs snacks. Her friends close their eyes after all the munching and crunching. Wordy does not. There is so much to see, and much to wish for now that it is fully dark. Quiet is what everyone else wants. Wordy does not truly understand that concept. When a cougar comes calling, looking for a 'nice, quiet dinner', his visit is cut short and he rushes away with hunger in his belly. You know who's responsible, don't you? The speech balloons, and the friends' cynical asides will delight and charm young fans. The setting will garner discussion and attention. 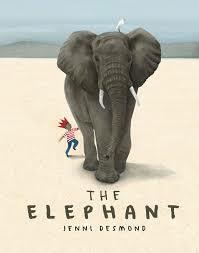 Dave Mottram's wonderfully expressive and funny illustrations are a perfect match to the text. 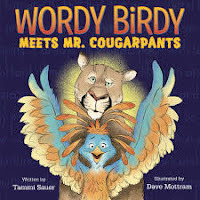 This would be a fun book for partner reading, and for a most enjoyable read aloud in any early years classroom. Pip is happily getting by being her normal self. She has many interests, including art, her family and plans for the future. When a new pig arrives at school, with a particularly ornery attitude toward Pip, Pip begins to question who she is and how to deal with the negative attention. The comments are persistent, resulting in Pip's anger and resentment affecting her family life. Mama isn't sure what to do, but suggests a trip to the city. That trip is a real eye-opener for Pip. She hears many languages spoken, sees pigs who do not resemble the pig she is, and is astounded by the wide selection of different foods which might, or might not, appeal to her taste buds. A conversation with an unknown pig at the picnic table gives Pip 'food' for thought. She returns to school with self-confidence, and a suitable response to the hurtful comments made by the new pig on campus. It is all that is needed to make Pip feel quite 'normal' once more. 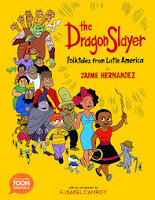 The illustrations are telling, and add depth to the story while also entertaining the young reader. Often subtle and certainly praiseworthy, I know you will find much to like this fine debut as both author and illustrator. both enjoy, like drawing ... "
I read this morning that the third Monday in January is designated Blue Monday, despite the fact that there is absolutely no scientific proof to support it being so. The holiday season has passed, winter still has many of us in its icy grip, and those who suffer with Seasonal Affective Disorder are definitely wishing for bright, warm sunshine to help combat the gloomy, cloudy days we have been experiencing for some time now. The winter blahs can get us down; some more than others. So, when this very timely and sensitive book was delivered this morning, I thought I would tell you about it. 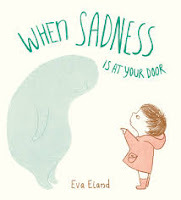 Eva Eland gives sadness substance ... as a shaped, bluish-greenish being. Sadness arrives at the door of a young child, holding a suitcase and making its presence known without any advance notice. It simply arrives. We are shown that it stays close to the child, and cannot be hidden. It even feels overwhelming. By communicating with Sadness, the child is able to chart a new path. Together, they gather themselves up to experience things they might both enjoy: drawing, music, hot chocolate, the outdoors, a walk in nature. Does it lessen the impact? It seems so for this small child. Rather than giving in to being angry about how the child is feeling, the acceptance of the emotion's presence brings some peace. There are times when we all feel sad. What we do about it can make all the difference. The endpapers express that sentiment clearly. This book for the young offers an opportunity for discussion and action. "But the king was still not convinced. Perhaps if I send the prince away, he wont' have to marry a kitchen maid. serve and protect his kingdom. But the prince is not trained for battle. He is sure to die. How can I help?" "As the stories grew and changed with every telling, the anecdotal became universal. Folktales often contain moral lessons; instead of telling us how to behave, they show us the implications of right and wrong behaviors to help us develop our social and emotional intelligence. They teach us how to be better human beings." For his first book for children, this talented and honored comic book creator immersed himself in folktales. Choosing three of his favorites and writing them from his own perspective, he has created a lively collection for young readers. A young and generous kitchen maid, in love with the prince, proves her mettle when slaying a dragon, stealing a gold ring, and saving the prince from certain death. A beautiful young woman marries the mouse she loves dearly only to have him fall into the soup; this time it is Dona Pepa to the rescue. Finally, three sons marry three daughters, and are tasked with the same jobs in preparation for the year's production of corn. The youngest proves the most ingenious and productive of the three, and reaps his rewards while also providing for the family. I like that the book ends with a clear history for each of the tales told, a comprehensive bibliography, and a list of online resources for further study. 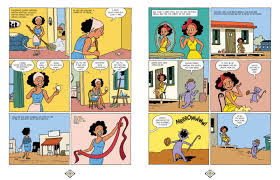 The graphic panels are accessible and most enjoyable for young readers. Terrific storytelling, and energetic artwork assure that kids are going to love it! "It starts to blow. We walk into the wind and we seem to be standing still but I think we're moving. All sorts of things are flying around. Mouse's ears flap like flags and he shuts his eyes to keep out the sand. I hold tight to the leash. It has stopped blowing now and Mouse's ears hang straight down again. I have two meatballs in my pocket for us to eat." Those who love dogs will read this heartfelt book numerous times. It has such warmth and love. It exudes quiet charm, and ends with a fervent wish. A little girl approaches a house, and asks if she can walk Mouse. She gets the expected response. Off they go. The dog is aptly described as slow, old, fat and 'with ears as flat as pancakes'. The love between the two is evident with every step they take. 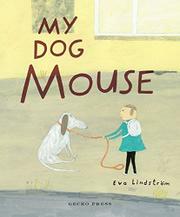 The girl is patient, kind, playful, and observant of all that makes Mouse so special to her. Their path is familiar, with stops along the way for food and rest. Their pace is determined by Mouse, and the walk ends when they have returned to Mouse's house. Asked about their adventure, the child is happy to report that it has been another successful day. She watches as Mouse accompanies his owner into the house and is lost to sight. Only then does the walker express a quiet thought ... "I wish Mouse was mine." In the final frame, it is easy to see that Mouse feels exactly the same way. The uncluttered double page spreads are as gentle and warm as the words they depict. It is a tender and memorable book, with light touches of humor, and sure to be enjoyed not only by those who have a special affinity for dogs.
" ... the longest, most versatile nose in the animal world. Elephants use their flexible trunks - part upper lip, part nose - to smell the air and earth for nearby food and water sources, and to pick up the scent of other elephants and possible danger. They also use their hose-like noses to breathe, drink, eat, trumpet, lift things, spray themselves with dust or water, to play, wrestle, dig, wallop, and to comfort and caress." Jenni Desmond has great concern for the endangered species in our world. She has chosen to share that concern with a young audience; the first two, The Blue Whale (2015) and The Polar Bear (2016), won praise and admiration for her ability to share her research in accessible and meaningful ways. Her realistic and and natural images of the animals she loves surely add to the appeal. The young boy on the cover is the impetus for this new book. He, too. loves animals - of the stuffed kind (elephant included); he favors a pot of tea at his side when he settles to read his new book about elephants; his menagerie is a willing audience for what he has to share. And, there appear to be a pair of elephants outside his window listening avidly as well. There is much detail in the first double-page spread that reveals the love he feels for these gentle giants. Ms. Desmond moves forward to help her audience learn as much as possible, adding more relevant and interesting information at every turn of the page. She provides maps, comparisons, territory, diet, anatomy, interesting and often unusual facts that are quite astounding. "An African savanna elephant male, or bull, can reach 13 feet tall and 24 feet long, and can weigh up to seven tons. That's about the weight of four large cars. The females, or cows, are half that size. Even baby elephants are big. At birth, an African savanna elephant calf can be 260 pounds, the weight of a speedy motor scooter." That puts it in perspective, doesn't it? The illustration of the young boy sitting atop the pile of fruit an elephant consumes in one day will provide fodder for thought! She adds a note concerning digestion and elimination. "Elephants don't digest their food efficiently, so that same fruit-devouring elephant might poo 12 to 15 times in one day, producing more than 300 pounds of steaming dung." I like that she uses scientific terms without explanation, assuming her readers will understand the context within which it is shared ... and most will. The beautiful images are created using watercolor, acrylic, pencil, crayons, and drypoint in a muted palette while the boy and his friend are much brighter. 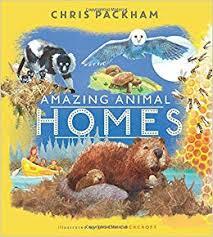 The details are infinite, the realism quite amazing, and the joy in sharing so much about this truly magnificent mammal make this an essential purchase for both home and school libraries. "In the kitchen, Otis smiled as he drank his coffee. And soon it happened. Outside there was a loud howl from Tripp. Otis opened the kitchen door and looked out. Tripp clutched his pillow, his tent collapsed on one side. He pointed to a message in the dirt. The 12 chickens who live on the farm with Otis and his family are well-loved. Each has a name, as does the rooster. Life on the farm is pretty quiet and the days pass with little drama. Until one day, when Otis and his wife have gone to town for supplies, the children notice something very unusual. Since the parents are not at home and the children know it was not their doing, there is a mystery afoot. Upon their return, and after a quick visit with the chicken named Trixie, Otis feels certain that Trixie did the writing. They are afraid to share that sentiment in fear their friends will think them 'nutty'. The messages continue, each written by a different member of the flock. Finally their mailman Tripp is first to see a new message one morning while making his rounds. No one believes it when he spreads the news to the townfolk. They are in disbelief, as is he. It takes a big surprise to convince Tripp about the writing. He is quick to spread the news. Visitors all flock to the farm to buy eggs and to see the 'chicken talk'. Finally, the seven white chickens, all named Joyce, make their true feelings known, and bring about change. Having a voice is an important message for the book's readers. Soft, warm watercolor artwork is a match for the gentle tone of the story and the peaceful farm setting. There is a great deal of affection displayed here, and a sense of peace when the reading is done. "Then we would pack into my dad's old car and head toward a very green and beautiful part of Iran called Shomal. We'd drive for about five hours, listening to Persian music on the radio and stopping to eat a picnic lunch in the forest along the way. Sometimes I took along my friend, Azadeh, and we'd share a kebab." Living in New York and visiting Coney Island is a new experience for Rashin and her family. As she tells readers a personal story from her past, she compares this visit to a similar visit made by her family when they were still living in Iran. There are differences; there are also similarities. As the family makes its way to the subway that will begin their musical and people-filled adventure, she explains that a trip to the Caspian Sea is a wonderful memory for her. The day begins early with halim for breakfast, and is followed up by a long and leisurely trip that finally ends in the beautiful waters of the sea. Their beach experiences differ from place to place -in rules, not enjoyment. "In some parts of the Caspian beach, there are beach rules, so I knew what was allowed. In that part of the beach, big, long curtains divided the sea into two sections - one side for the men to swim in and the other side for the women." it's a fun chaos, too, though I don't know anybody. Families of all colors stream from the redbrick apartment buildings. The sidewalk vibrates with music, and the kids chase each other." There are ice cream trucks in both places. Saffron ice cream is Rashin's favorite. No luck for her at Coney Island. Tears come quickly as Rashin confronts some of what she misses from her homeland. A smile and a suggestion bring a happy ending, and perhaps the start of something new. The artwork is full of life and gorgeous! Filled with texture and charm, the illustrations help share this exuberant and memory-filled personal story. There is such a sense of joy, while reflecting on scenes from two different cultures - so important for all children to hear! "Once, in the Serengeti Plains of East Africa, I watched a clan of hyenas kill a zebra on the boundary between their hunting grounds and their neighbors'. The neighbors raced to the kill, and the two clans fought fiercely over the carcass. When the fight was over, members of both clans - many of them wounded and bleeding - pooped nearby." And so they declared the boundary had not changed. 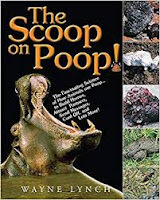 The presentation of so much information concerning poop, and how it used for home building, attracting mates, sending messages, and cooling off is humorous, engaging and very accessible. Written conversationally, readers might even be unaware of just how much they are learning as they explore its pages. "I always wondered why cows produced so much poop, and why they always seemed to poop the minute got into the barn to be milked. When I questioned Uncle Woodford about this, his answer was short and simple. "They poop inside the barn so that there's something for you to do on rainy days." That answer may not have led to Dr. Lynch's future in science; he did, however, find (in later life) that poop was quite an interesting topic. Who knew? You will have lots to share when you have finished reading this informative book. Surely, some of it will find its way into conversation with humorous results. "The African elephant is the biggest pooper of them all. A ball of elephant poop can weigh one to two kilograms, or two to five pounds (you don't want to get hit in the head with one), and the animal drops more one hundred of them a day. That's enough poop to fill the trunk of a family car." Take that to the dinner table ... or any number of further revelations. There is much to enjoy here. There are colorful photographs aplenty. Captions are clear and add context. Personal stories add interest and humor. The design ensures a sense of not being overwhelmed with the facts stated. Four short chapters organize the data provided: Poop Is Fascinating Stuff, Poop Tarts (my personal favorite), The Power of Poop, and People and Poop. A quiz will find willing participants and an index with take interested readers back to particular pages. I want to scratch it. What? Piggie and Elephant, and dinosaurs, too! Who can resist that combination? that make you feel things? Then, I have a book for YOU! I feel you will love it!" A message on a rock reads DINOSAURS DO NOT SCRATCH. The turtle snoozing there is surprised to hear what the passing dinosaur reads. The dinosaur is intrigued with this new learning and makes herself the keeper of the knowledge. When a passing dinosaur bends to scratch a knee itch, she is quick to put a stop to the action. Itches are NOT to be scratched, as it the sign instructs. With each new 'itcher' comes an admonition to be TOUGH, and hang in there together. That is what dinosaurs do, after all. No matter the temptation to ease their suffering. the tip of this feather? The testing doesn't even stop there! Then, comes the big surprise. 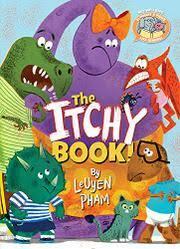 Are you itchy yet? Piggie and Elephant certainly are!!! There is such charm in the characters, fun in the brightly colored artwork, and humor and expression in the color-coded speech bubbles that move the action forward. Perfect for getting kids excited about reading great books. There is a lot of excitement; it's easy to tell! 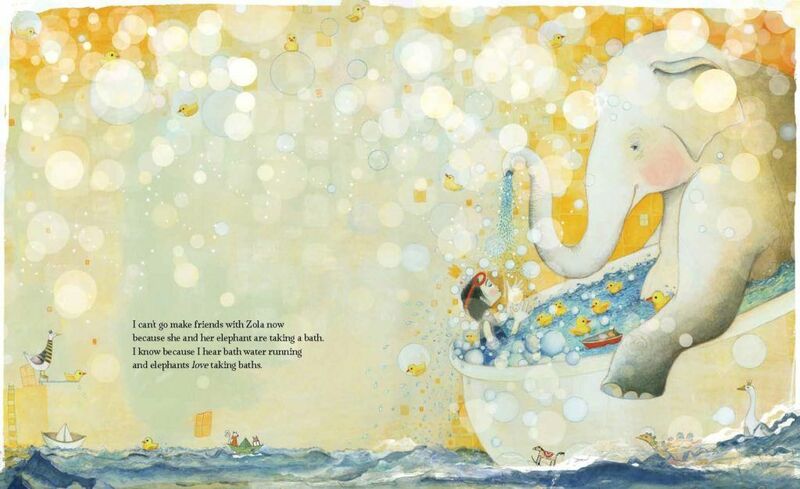 In this fourth book in the A Narwhal and Jelly Book series, Narwhal and Jelly are out for a swim when they meet Otty. 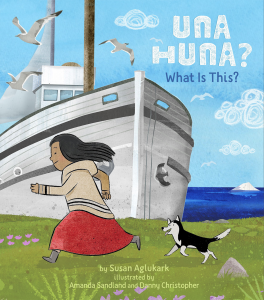 Otty introduces herself as an explorer, and follower of the great Captain Sally Goodhart. It takes no time at all for Narwhal to decide that adventuring together would be fantastic. Jelly is a tad doubtful. Waffles are sure to provide the energy they need to get started. Thus, chapter 1 comes to an end. As he has done in previous books, Ben Clanton provides specific information about otters, while Jelly butts in to add important further info about ... well, jellyfish. Is Jelly jealous? Yes, and angry, and off to find new friends. Not much success in that endeavor, unless you count the rock and the imaginative antics the two share.as sidekicks. 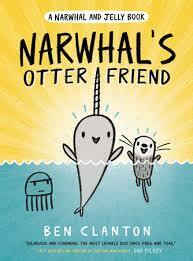 When all seems lost in the friendship department, Narwhal and Otter return with an idea. It is an awesome plan, with a missing part. 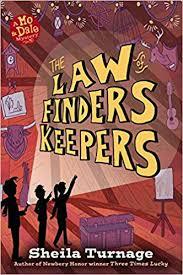 This is a great series for little ones, and beginning readers with short chapters and familiar characters. Full of action, dialogue, and humor, the series has already garnered many fans. The graphic form allows for shared reading, plenty of expression, and an opportunity for discussion. "Before all was said and done, it plunged me and my fellow Desperados - my best friends, Dale Earnhardt Johnson III and Harm Crenshaw, the agency's newest detective - into a blood-thirsty chapter of our town's history, and an unspoken chapter of Harm's past. It put our lives in peril, and sent us racing for treasures of the world and treasures of the heart. As for me, Mo LoBeau, it bent my rivers and scattered my stars." Okay, after reading those opening lines, I doubt you will be able to resist moving forward with this wonderful tale of friendship, family, heartache, and hunting for treasure. If you have read the first three Desperado Detectives tales, you have likely got this one on your book shelf already. I know - I have been waiting 3 years to meet up with these fine young people again. If you are not a fan, or haven't heard anything about Three Times Lucky (2012), The Ghost of Tupelo Landing (2014), or The Odds of Getting Even (2015), you don't know what you are missing. My best advice would be to find the first three books, add them to this one, and spend a weekend getting to know Bo, Dale and Harm as well as the other exemplary characters who make their home in Tupelo Landing, North Carolina. It makes me sad to think this is the final book in this fabulous, funny and memorable series. Mo is still searching for her missing Upstream Mother when another search begins in town. The search for Blackbeard's treasure brings Gabriel Archer, a professional, who has his eye on it. Of course, the Desperadoes are interested. They could use the money, and they like a challenge. They are not willing to be as unscrupulous as Gabriel and Kat, his partner who also happens to be Harm's mother. But, they have their ways for solving mysteries successfully. The clues are numerous, the danger imminent at times, and the new clues about Mo's Upstream Mother have the detectives wavering between which case is most important. Will worldly treasures win, or will be it the treasures of the heart? It won't take you long to find out because, once you get started reading, it's pretty tough to stop. As I have done in the first three, I found myself stopping often to savor the storytelling. It made me sad, it made me laugh out loud, and it gave me characters to live in my memory for a long time. at Attila. "What about your friend?" Attila had perched on the yard swing. "That's my enemy. She ain't hungry. Neither are we." Dale is skilled in the art of dessert diplomacy." of you. Dale and Harm came just to say hello. said time to eat, but I couldn't find it's taste. What a voice, what charming characters and setting, what storytelling! You should NOT miss it! My copy is headed straight for the 'keepers' shelf. and had them sent to the classroom. This is such a powerful, yet tender, free verse novel about a boy (and his rotten bad year) and a summer spent with his grandmother. Readers know from the opening lines that he accepts responsibility for all that happened. It takes a while before his whole story is told. Things during the time leading up to the summer visit have, obviously, not gone well. When his father goes to prison as a result of a terrible drunk driving accident, Jett and his mother move to a new place, a new school, and a shameful friendship with Junior. Junior has troubles of his own, and Jett is a willing participant in some pretty contemptible behavior. Jett is mad and vents that anger through those actions. Throughout the summer, it is evident that Jett loves his grandmother and she loves him. She works quietly to calm his anger, and boost his self-esteem, which is at an all-time. Her support and the comfort he has always felt in her company lead him to share the events of the past year. That was a real tearjerker, huh? I did a bad thing this year. Full of heart and hope, this beautifully written first person narrative shares the regret Jett feels for what he has done. His love of language is shared by his grandmother, and provides some needed humor for those reading his touching story. Both main characters are deserving of the reader's attention and admiration. Their relationship is strong; the change doesn't come easy but is worth the hard work. In the end, Jett hopes to find forgiveness from the man he has hurt so badly. Maybe then he will finally be able to forgive himself. I met myself everywhere ... "
This quote features the initial lines of a poem to readers by Eve Ensler. She is a playwright, performer, activist, and author. Her long poem cites the many things she was able to do because she was a reader. It is a loving ode to the power of the word. Facing her poem is an illustration by Zoey Abbott, whose other work graces the pages of two books I love - Twindergarten and Finn's Feather. I could go and on. When it arrived in the mail yesterday, I immediately sat right down and pored over it page by page. At more than 250 pages, it is sure to be a book that I will read over the course of weeks, even months. That is the real appeal for me. I can take my time to savor the words and sentiments, and appreciate the variety in the artwork that accompanies each and every entry. The design remains the same throughout its entirety. 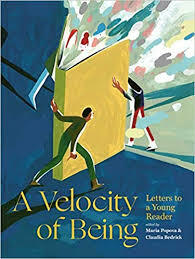 The verso is the letter written for young readers, with a short descriptive paragraph about the writer at the bottom of the page and a banner for the artist at the top. The recto is resplendent with the images created to accompany that particular letter. Finally, a list of the artists with their respective descriptive paragraph finishes the book. Maria Popova, owner of the Brain Pickings website, and Claudia Zoe Bedrick, publisher, editorial and art director at Enchanted Lion books, have spent took eight years at work on this project so dear to their hearts. It is a labor of love for readers and those who love books. All 121 writers are diverse - each one reflecting on the joys of the reading experience. Couple their words with the diverse images created by a plethora of talented artists and you hold something very special in your hands. Take time to enjoy its many riches. "100% of the proceeds will be donated to the New York public library system in gratitude for their noble work in stewarding literature and democratizing access to the written record of human experience." What a celebration! Bravo to everyone involved. I will savor every letter, as I have admired every piece of stunning artwork. I have not much time to write to you, and not much ink in my typewriter, but I hope I can convey a very important message before my time is up and my ink is gone. Somewhere in the world, on some shelf or in some cupboard, in a library or a bookshop or a bedroom or a ditch, there is one book with a very important message for a specific person. In most cases, the person has no idea which book it is, or where this book may be found, which is why most readers in the world go from book to book, from shelf to shelf, searching for the perfect read. In many cases it can take a lifetime ... "
school to show his teacher. "Hamish left me a feather!" One of the things I know from experience is that children look at death in a very different way than we do as adults. When their grandmother died our kids, who were 7 and 10 at the time,themselves responded from two entirely different perspectives. There are numerous stories for parents and teachers to share with children concerning death; many of them are very good. This book tells the thoughtful and heartwarming story of a boy named Finn. One spring morning he finds a feather on the doorstop. He remarks on its beauty; it looks perfect to him, it's white, and he is quite amazed by it. In fact, he tells his mother that he thinks his brother Hamish, who has died, is responsible for leaving it. His mother's reaction is a tad disconcerting. Shouldn't she be more excited? His teacher has a similar response. Lucas, Finn's best friend, responds differently. 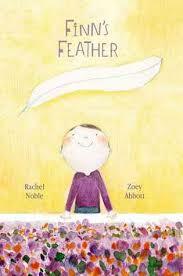 "A feather. I think my brother Hamish sent it." "Really? Angels can do that?" asked Lucas. "I think they can," said Finn." When deciding what to do with the feather, Lucas suggests they should play with it. It tops a castle and tickles a chin before it blows away and is caught in a tree. Once retrieved, Finn holds it tightly to keep it safe. Happy on his walk home with his mother, he thanks Hamish for the gift. Using the feather as a pen, he writes a very special letter to his brother that he and his mother will leave in their tree to be carried away on the wind. The lovely artwork perfectly complements the tone of the story told, while also showing the highs and lows that children experience as they come to grips with loss. 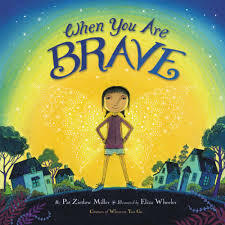 There is variety in the ways we grieve and remember loved ones; this book helps us understand that. "Yes, Papa! And today my teacher told us every story has an elephant of surprise. 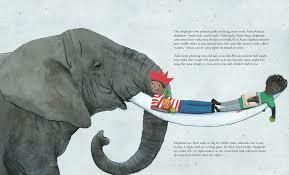 So let's read a story, and we'll find the elephant." "Chicken, she wasn't talking about an elephant. She was talking about an element of surprise." "What's an element of surprise?" David Ezra Stein won a well-deserved Caldecott Honor award for his first book about this feisty, imaginative and indomitable little red chicken. 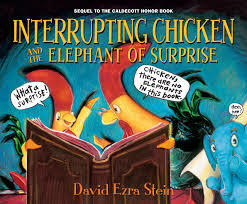 In the past eight years I have read Interrupting Chicken (Candlewick, 2010) innumerable times to children, teachers and teacher/librarians. 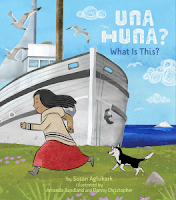 It has everything you would want in a book to be read aloud to a group. I didn't know I was missing her until this book arrived in the mail. She's in school now, and loves to bring what she has learned home to her Papa. Papa is ever willing to listen to what his chick has to say. In this case, he does his best to convince her that she has misheard a word from the teacher's lesson. It is element of surprise, not elephant. When she asks what an element of surprise is, he is quick to try to help her understand. "It's the part of the story that makes you say, 'Whoa! I didn't know that was going to happen,'" said Papa. So please, let's read a story together." any elephants in this story...."
Saying that, he has not a clue about how wrong he is going to be. Papa proceeds to voice the fairy tales in the book they are reading. Each one takes a hilarious turn when an elephant does indeed makes it presence known. On they go from The Ugly Duckling to Rapunzel, and to The Little Mermaid. Despite his assurance that there is no elephant in the tales he's reading, Chicken makes her point clear. There is an elephant in each one. Together, they decide to write their own story. Papa will tell it, Chicken will supply the art. Will Papa win his point? What do you think? Bright and homey artwork fills the pages that show the interaction between father and daughter. A distinct change occurs with each of the tales told. 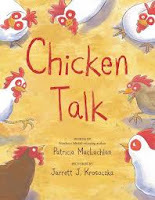 Those interludes are illustrated to grab attention and provide details while packing just the punch needed to up the humor and provide a focus for what Chicken has been learning at school. So much fun! You won't want to stop reading and your listeners will not want you to stop. Inside, I listened for clues. Maybe it was a mouse. And that is when I saw it. It was the biggest mouse ... "
Here's another bear book ... and a mystery! 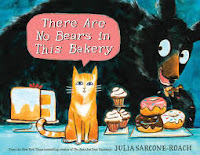 Does that you remind you of this author's previous book, The Bear Ate Your Sandwich (Knopf, 2015)? It should. If you haven't had a chance yet to read that book, get thee to a library or bookstore. You won't be sorry to take it home and read it to your kids. I stepped out to investigate." No sounds outside near the bakery. Investigation requires an open window and a brave heart. What Muffin thinks might be the biggest mouse ever seen turns out to be the littlest bear ever encountered. Its presence is as surprising as Muffin's discovery. Loud hungry tummy growls alert Muffin to the real problem, and a solution. They are in a bakery, after all! That first revelation is not the last for the evening. Case closed. The witty storytelling is filled with charm and humor. The blue-black darkness adds just the hint of light needed for young readers to fully understand what is going on here. You don't want to miss it! I hope that you and your family found time to get outside and do some exploring during the holiday season. I'm sure that author Patchen Barss would have the same wish. He has a special interest in patterns and where they are found in nature. 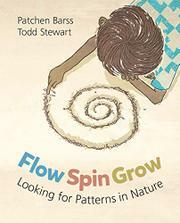 In this book written for young children, he encourages readers to look closely at patterns that are part of their daily lives. 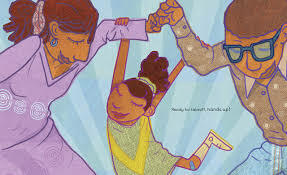 Each double page spread asks children to be present and to take action. As the quote included above shows, he wants them to take note of those things they often pass by when they are out in the natural world. As children look, climb, dig, they will begin to notice common patterns they often miss while playing. streams combine to form huge rivers. The connections he makes will be as fascinating for the adult reading the book as they are for the children who are listening. It is fascinating to find that there are no easy answers, but each discovery we make does tell us something about the way nature works. Todd Stewart does a commendable job of bringing the concepts to life. 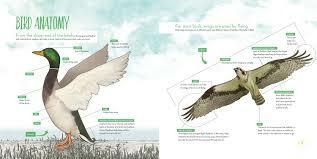 The opening double page spread shows young readers all the ways in which they might find out more about the outdoors. Changes in perspective in the artwork are worthy of discussion and engagement. His gentle lines and color choices will encourage kids to get out and to see what is right before their eyes. Isn't that the best way to fall in love with the beauty of our world? Why do patterns appear in places you might never expect to see them? This book will help get them started at taking a closer look. An author's note encourages that exact thing. "Be watchful. Be thoughtful. Ask questions. Make connections. explanation. You never know where patterns will lead you." What a truly beautiful book this is ... both in story and art! When Zola and her family move into their new house, her mother knows that the neighbors have a little girl. In fact, she and that girl's mother have already had a conversation concerning their daughters and decided they will be friends. 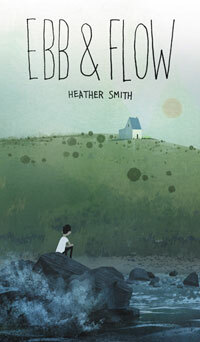 The girl next door is the narrator of this thoughtful and imaginative tale. She watches as the truck is unpacked, knowing that her mother would like her to be friends with Zola. She is convinced that the biggest box unpacked holds Zola's best friend - an elephant. She knows that Zola is very busy with her elephant friend, as it will need to eat lots of food, to take a bath, and to play games. She knows because she can hear all the sounds that prove what is happening behind closed doors. She is convinced Zola will not be looking for another friend. Each turn from a page of text shows a gorgeously illustrated, wordless double page spread of what is really happening at Zola's house. 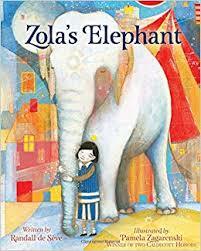 Things are not as the girl imagines; in fact, Zola's day is tedious and very lonely. Will our shy narrator take a leap of faith and make the decision to pay a visit? Will her love of elephants help her take the risk? The imaginative language of this charming tale is perfect for reading on its own. Adding the gorgeous multimedia artwork that creates two very different scenarios makes it even more perfect! That combination makes it a very special book to read and then read again. I love the 'circus' feel throughout. It will encourage much discussion as the book is read. The color palette chosen is just right when showing the joy of the imagination paired with the loneliness of Zola's reality. Parallel realms exist in different dimensions. Time travel is like whizzing down a slide. Crossing dimensions is more like skipping double dutch. You got to wait for the right moment and slip in between the ropes." I swat at the biggest mosquito I've ever seen. My clothes are sticking to my skin, but I'll get eaten alive by bugs if I take off my shirt." If you teach in a middle grade classroom, you will know someone who's interested in dragons, magic and transporters. 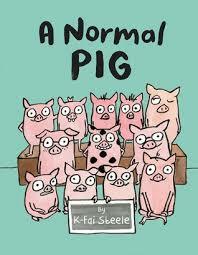 This book is sure to capture their attention and provide a very satisfying read for them. Jaxon and his mother live in Brooklyn in a rented apartment; they are soon to become victims of their landlord who is threatening eviction. The situation leaves Mama in a sticky spot. She must go to court to fight for their rights. She needs care for Jaxon for the day, and decides to leave him with Ma, the old woman who raised her. It is not a happy situation for any of them. Jaxon does not know anything about Ma, who is clearly not happy to have him dropped on her doorstep. It doesn't take long for Jax to learn why! Ma is very protective of a mysterious, moving cardboard box that has just been delivered. Ma suggests that Jax find a book to read while she deals with her business. The serendipitous discovery of a book written by an authority on dragons who lives in Madagascar leads Jax to learn all he needs to know about Ma, her calling, and the task assigned to her. Suffice it to say Ma is a witch, and she must deliver the package to a magical place where others are awaiting delivery of the tiny dragons inside the box. Jax will go with her. A guardhouse at one of the entrances to Prospect Park provides their means of transport. When the transporter malfunctions, they land in an unfamiliar time and place which puts them in eminent danger. Ma sends Jax back home alone. There, he enlists the help of Ambrose, Trub, and his best friend, Vikram. Vikram's little sister, Kavita, causes chaos that will lead to further adventure for Ma and Jaxon. Mama is NOT be pleased. Saying that, she does accept her son's need to follow the path that is his to explore. 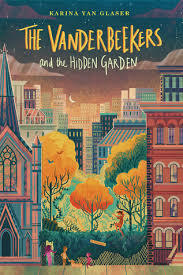 This wonderful fantasy set in an urban landscape, and filled with genuine, admirable characters is sure to garner many fans who will wait impatiently for the next adventure.